Welcome back to another edition of The Porcelain Throne, our user-run series in which we explore the discographies of our favorite bands. Want to write about your favorite band? Click here to download The Official Porcelain Throne Guidelines, and send your submissions to tohthrone@gmail.com. Today, MoshOff is plumbing the depths with Nevermore. Formed in 1992 out of the ashes of Seattle US Power Metal entrepreneurs Sanctuary, Nevermore differentiated themselves from the pack by combining melodic and dramatic vocals with heavy, dissonant and groove-ridden instrumentation to create a unique style that is hard to categorize. 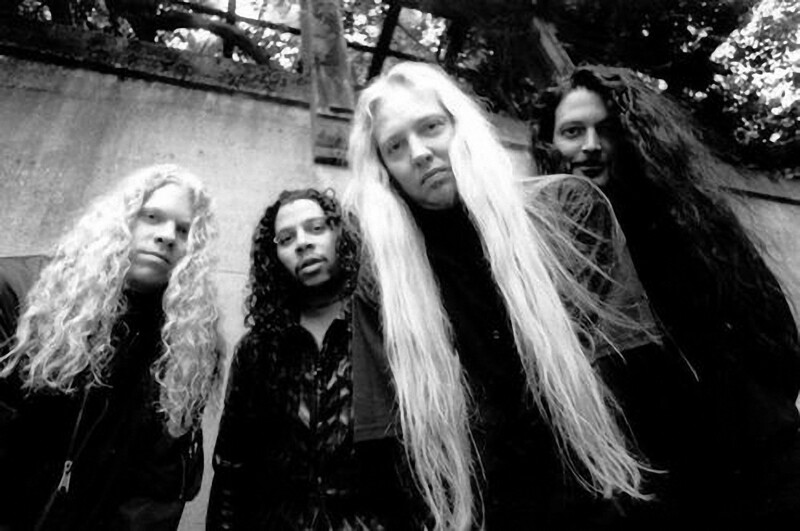 During their almost 20-year tenure as a band, Nevermore’s core lineup was comprised of (as pictured above) guitarist Jeff Loomis, drummer Van Williams, vocalist Warrel Dane and bassit Jim Sheppard. Throughout the years a slew of different second guitarists were brought in as permanent or live members, including Chris Broderick (ex-Megadeth), Curran Murphy (Shatter Messiah) and Attila Vörös. Before describing each of their releases, I think it’s good to differentiate between Nevermore’s two distinct periods as a band. Their first three albums are in a progressive power/thrash style, while their later four are more in the groove/”melodeath with clean vocals” vein. Up until and including Dreaming Neon Black, the band worked with producer Neil Kernon, and then switched to working with Andy Sneap for the rest of their career (with the exception of The Obsidian Conspiracy), resulting in more “polished” sounding albums starting with Dead Heart in a Dead World. Compiled from two different demo sessions with Neil Kernon, Nevermore’s self-titled debut saw the band harnessing a sound more in line with the power metal stylings of then-defunct Sanctuary than the one they would come to adopt on later releases. That’s not to say that they sound exactly alike, though the band’s initial four piece lineup was 50% made up of 40% of Sanctuary’s core members, none of which was guitarist and main writer Lenny Rutledge. This role was filled by Jeff Loomis (who was barely into his 20’s at this point), with his signature riffing and soloing style still in development. On top of that, Jim Sheppard delivers precise, pounding (and audible) bass lines, Warrel Dane provides soaring vocals that demonstrate his wide range of abilities, and Mark Arrington (original NM drummer who played during the first demo session) and Van Williams both lay down the grooves that propel this album forward. Nevermore’s first offering might be a bit rough around the edges, but it’s a great introduction to all the different elements that the band managed to succesfully meld during their career. Born from the same recording sessions, In Memory and The Politics of Ecstasy are two sides of the same coin. Now operating as a five piece after the addition of co-lead guitarist Pat O’Brien, Nevermore start to find their sound with these releases. The former, an EP, showcases the band’s more slow and melancholic style (you might even call some of the songs ballads), featuring fan-favorite Matricide, while on the latter they take a much more technical approach, incorporating complex riffing and progressive time signatures. Warrel Dane almost completely eschews his trademark high-pitched vocals of the Sanctuary days in favor of a more mid-ranged style that would become synonymous with Nevermore, and the newly formed guitar tandem produces an overall more dissonant sound. A year after the release of Poltitics, however, O’Brien left to join Cannibal Corpse, and the band recruited former Forbidden guitarist Tim Calvert to continue work on their next release. In my opinion, concept albums are pretty hit or miss, but Nevermore really knock it out of the park on Dreaming Neon Black. According to Warrel Dane, the album tells a story “about a man who slowly goes insane after losing a woman that he was very close to”, which is apparently based around the fact that an old girlfriend of Dane’s joined a religious cult and was never heard from again. Listening to the title track and Warrel’s duet with Christine Rhoades, one can almost begin to feel overwhelmed by the almost impossibly passionate vocal delivery. The music itself is everything that was only slightly hinted at on The Politics of Ecstasy: it is extremely dark and atmospheric, and the dramatically emotional vocals fit incredibly well over the dissonant, jagged guitar riffs. Whereas last time around the band decided to release the “slower” and “heavier” songs separately, this time the more melancholic ones (“Dreaming Neon Black”, “All Play Dead”) are intertwined with the more aggressive ones (“Beyond Within”, “Poison Godmachine”, “No More Will”) to give the album a really good flow that makes the hour long listen seem utterly insignificant. Released just under two years after its predecessor, Dead Heart in a Dead World marks a somewhat drastic change in Nevermore’s sound. This is mainly due to two things: the band decided to change gears and work with Andy Sneap at the same time that Jeff Loomis switched from 6 to 7-stringed guitars. Interestingly enough, being tuned lower didn’t make the music heavier; most of the songs on this album are more straightforward in structure and much less “dark” in tone, especially the borderline power ballads The Heart Collector, Insignificant and Believe in Nothing. Warrel Dane’s vocals are still on the sorrowful side and his lyrics still deal with his favorite upbeat topics (drugs, politics, religion and heartbreak), but the music and arrangements make for a record that is more hopeful than hopeless. Not that that’s a bad thing at all, it’s just decidedly different. Still without a permanent second seven-string-slinger and not entirely pleased with the sound of their previous effort, Nevermore enter the studio with producer Kelly Gray to record Enemies of Reality. This time around the band turns up the heaviness a bit, coming up with generally shorter, more concise and aggressive songs. Not that there aren’t any ballad-type songs though; Tomorrow Turned into Yesterday and Who Decides fill that quota nicely. Nearly every song on this record has harmonized vocal leads, showcasing just how beautifully Warrel Dane’s voice mixes with itself. Unfortunately, the change in engineer was one for the worst, and the band didn’t think the original mix did the music justice. They decided to have Andy Sneap remix it for re-release in 2005, and since then the original version has become a sort of collector’s item for fans. With the addition of guitarist Steve Smyth (of Testament and Dragonlord renown) to the official lineup, Nevermore produced what is probably the most musically ambitious album of their collective careers. From the thrash attack of opener Born to the final neckbreaking moments of the grandiose title track, This Godless Endeavor is packed full of just plain RIFFS, blazing guitar harmonies and solos (including a guest contribution from James Murphy on instrumental The Holocaust of Thought), instantly memorable choruses (Sentient 6, Sell My Heart for Stones) and concise drumming, all wrapped up in one tight package that placed Nevermore atop the Metal Pantheon… or rather, should have. In the years following the release of the record, what should have been a well-deserved rise to fame was stunted by medical maladies: Steve Smyth needed a transplant after being diagnosed with a chronic kidney disease, and eventually left the band after more than a year of being unable to tour; Jim Sheppard underwent a procedure for Chron’s disease and also missed tour dates; and Warrel Dane suffered from type 2 diabetes and different infections, forcing the band to cancel several shows. This streak of bad luck, paired with the fact that both Jeff Loomis and Warrel Dane released solo albums in 2008, raised questions regarding the band’s future. So when the announcement came that there would be a new Nevermore record after several years of inactivity, the hype train was in motion for quite the letdown. The Obsidian Conspiracy feels like someone took a perfectly fine Nevermore album and chopped the songs down to make them more accessible (especially “lead single” Emptiness Unobstructed), and that’s apparently not far from what happened with Peter Witchers at the production helm. There are some great moments on the album (like the unconventional The Blue Marble and the New Soul), but overall it feels lacking coming after such a great string of releases. It is, sadly, a not-so-fitting end to an otherwise pretty spotless discography. In April 2011, not even a year after the release of The Obsidian Conspiracy, Jeff Loomis and Van Williams quit Nevermore citing “personal and musical differences”, for a change. Unable to find suitable replacements, Warrel Dane has said that the band isn’t over, just on “hiatus” or whatever. Since then, Van Williams has been involved with Pure Sweet Hell, Armageddon, Ashes of Ares and Ghost Ship Octavius, Jeff Loomis has been busy with Conquering Dystopia, Arch Enemy and his solo band, and Jim and Warrel have been recoding and touring with a reunited Sanctuary. It seems as though there is currently no bad blood here, and no one is ruling out a reunion in the future, so at this point only time will tell. I know I’m not alone when I say that many Nevermore fans like myself think that Dane, Loomis, Sheppard and Williams still have it in them to convene for enough time to make an album that gives a more deserved end to one of the most distinguished bands in metal. I hope you find something enjoyable in their discography. Thanks for reading!